We have been discussing messaging options for intra and inter-process communication. 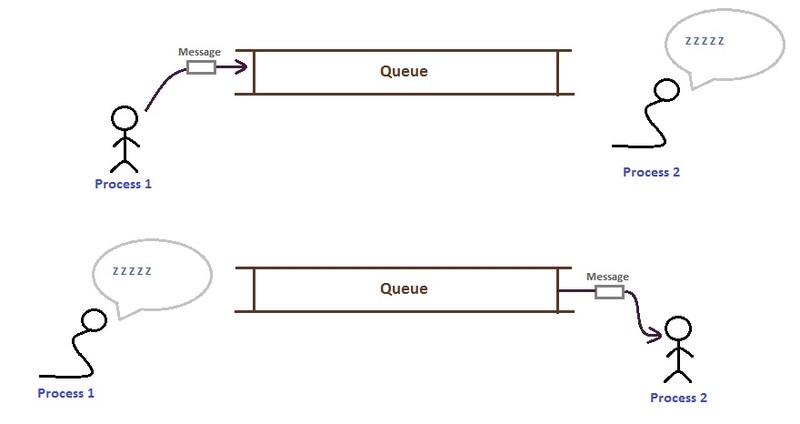 Message Queuing is also a messaging infrastructure. 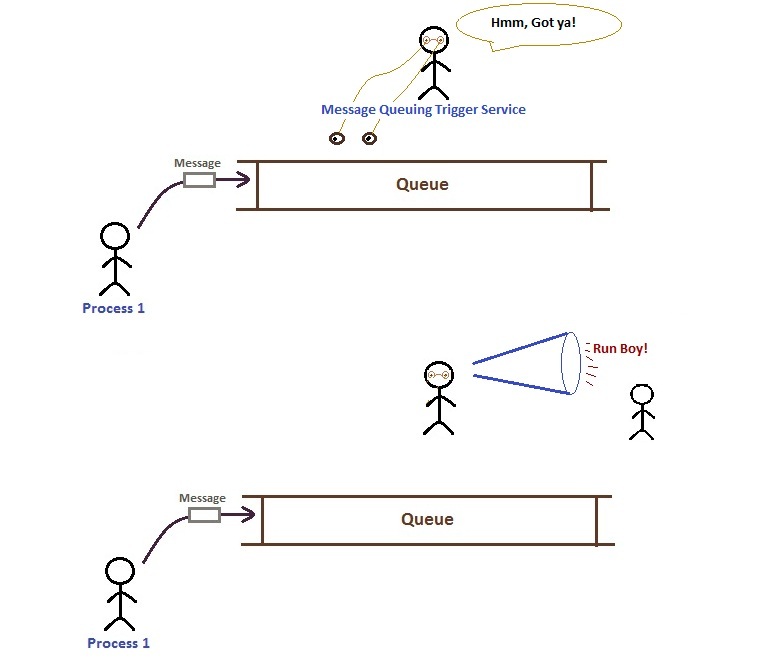 The Microsoft product for Message queuing is MSMQ. 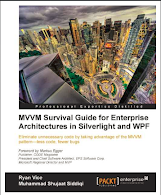 There are various other products like JMS (Java Messaging Services), Apache’s Active MQ and TIBCO’s EMS which you might consider for enterprise messaging. Before we start using MSMQ we need to install MSMQ services on the machine we expect to keep queues. MSMQ types are in System.Messaging namespace. This is available in System.Messaging.dll. In order to use these types, we need to add a reference of this assembly. 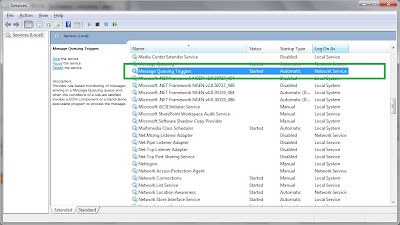 We can create a MSMQ queue using Computer Management Console. 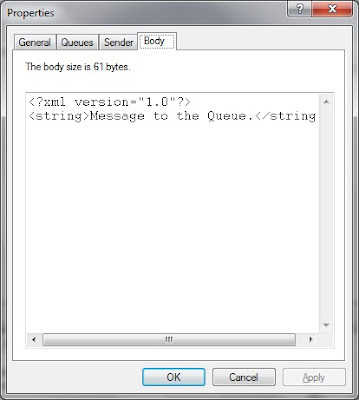 If a queue with same name already exists, it results in System.Messaging.MessageQueueException with exception message "A queue with the same path name already exists." It is very simple to queue messages in MSMQ. 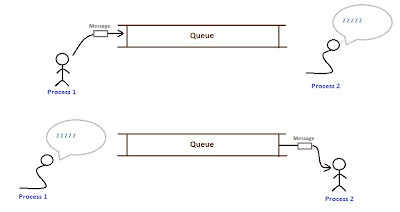 We just need to create an object of MessageQueue and send a message to the queue. 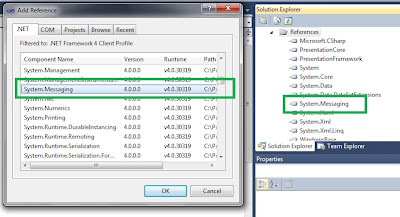 The below code is an event handler for a button click event. It is demonstrating how we can send message to the queue. Here . (DOT) refers to the local computer. 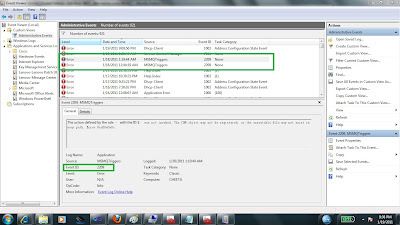 As we send message to the queue, they become available for administration in Computer Management Console. 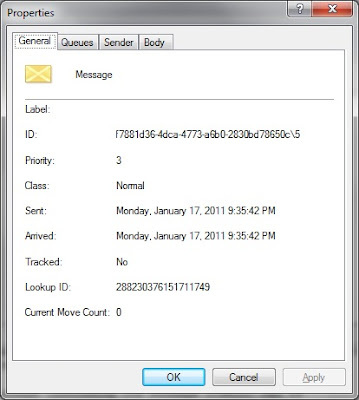 Various useful information about the message (including the message itself) can be found by taking the properties of the message in the same Window. To receive message from the queue, we just need to specify queue name including the complete path where the queue resides. We also need to specify the format of message. Here we are sending string message. 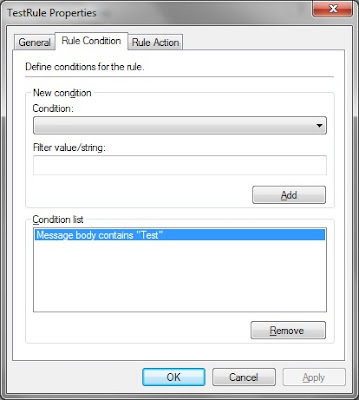 We might need to share Interface definition between sender and receiver for message type if we are planning to send more complex messages. It must be remembered that Receive is a synchronous / blocking call. 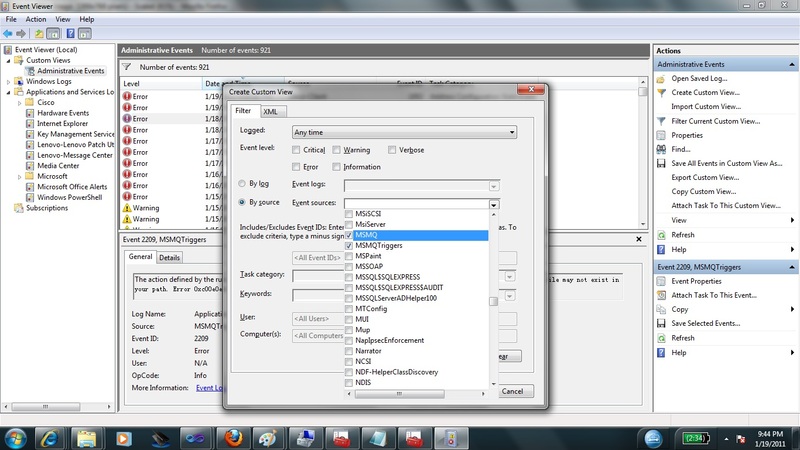 You would be glad to know that MSMQ also has an asynchronous version of Receive. It is BeginReceive. 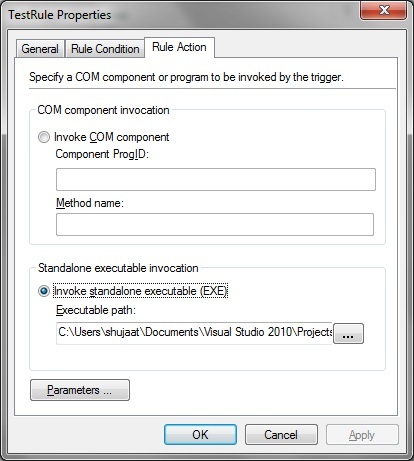 It supports the specification of a callback which might be executed when the expected message is received. Here we are using a timeout of 20 seconds. We passed the queue reference as stateObject in order to use it in the callback. By this way we are also avoiding the use of Captured variable from outside lambda. BeginReceive creates a ThreadPool thread. Since we are on a thread other than UI thread, we are using Dispatcher to copy the message to the interface. If the message is already available in the Queue, the callback would execute as soon as you call BeginReceive on the Queue. 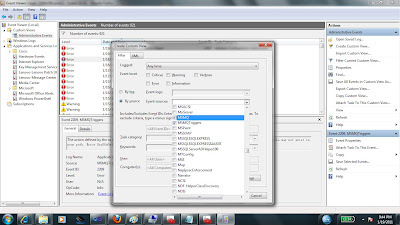 You can use the attached project to send and receive message using MSMQ. 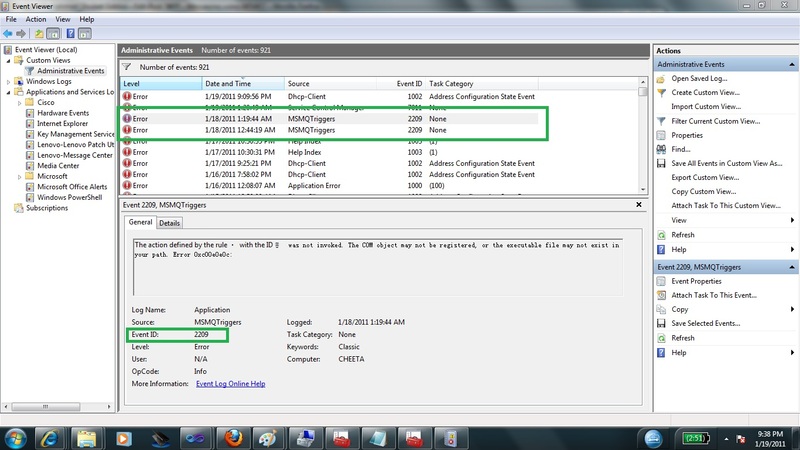 MSMQ also allows us to execute an activity based on certain messages. We can peek / retrieve messages of interest and run those activities. 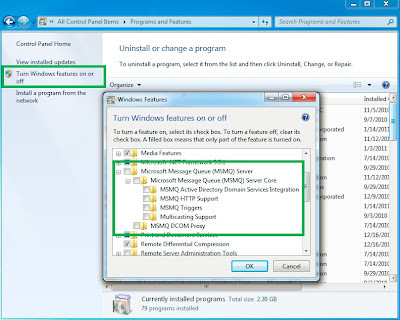 These activities might be in the form a COM component method or an limited executable (*.exe) file. 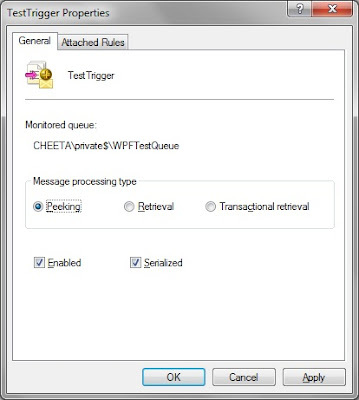 Message Trigger Service is installed separately. You can see find that in Services.msc. It allows you to define a set of triggers. 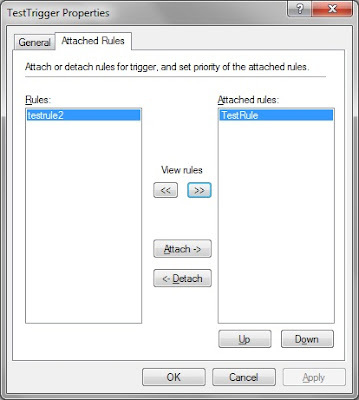 Each trigger can have a set of rules. Each rule has conditions and associate actions. 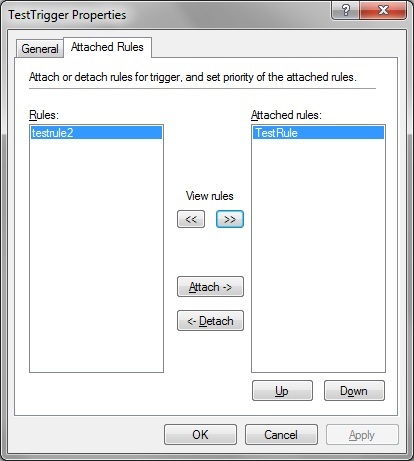 For each message arriving to the queue, all rules in each trigger run. 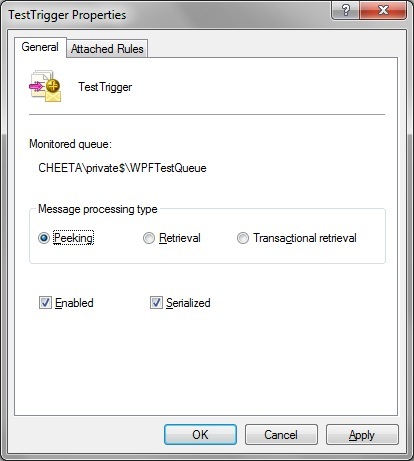 The trigger service should have associate (Peek, Retrieve rights on the message queue). A rule might have some conditions and an action associated. 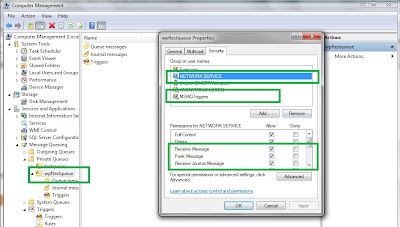 As apparent from the above image, Trigger Service in MSMQ 4.0 runs with Network Service account. 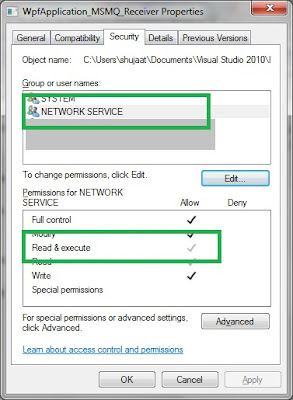 It is required that you give Read and Execute on the Executable file. 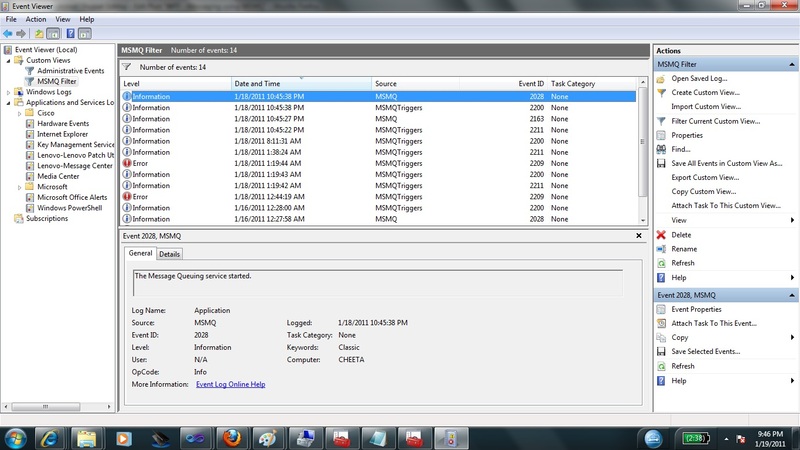 MSMQ Triggers service reports warning messages in the Event Viewer. 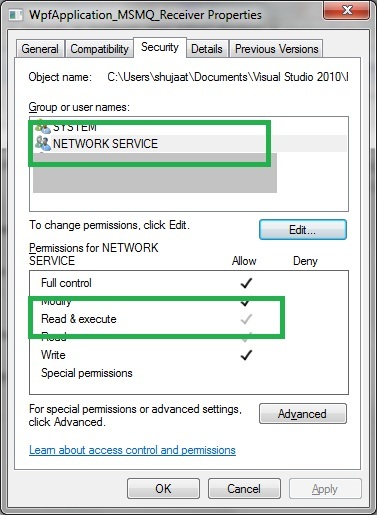 The following is an example when the service could not find the executable file in the specified path. We can also create custom view just for MSMQ related messages. 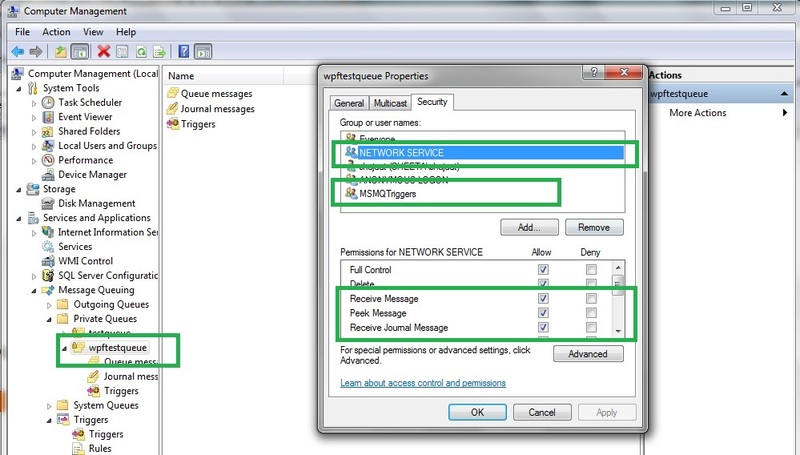 In this example we are interested in messages from MSMQ and MSMQ Triggers services. 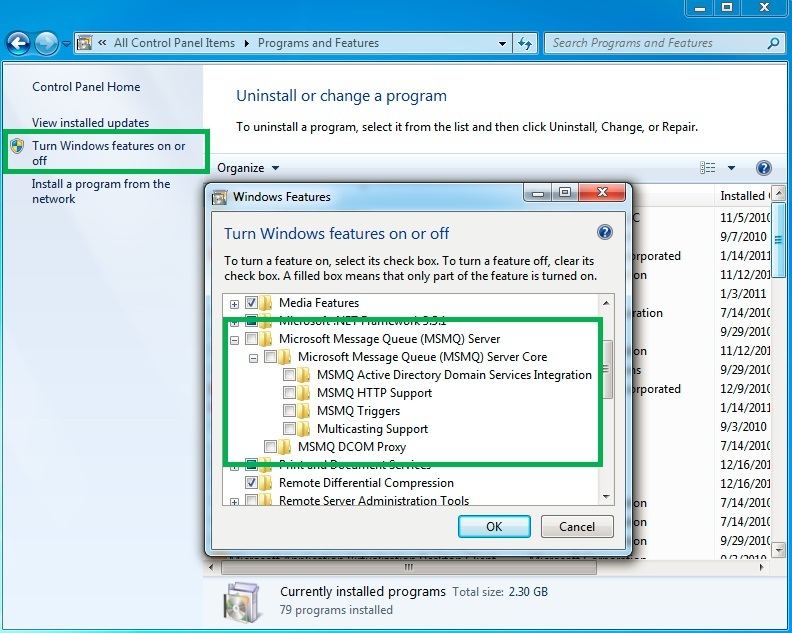 Being a service, MSMQ Triggers can not launch an executable which have user interaction. 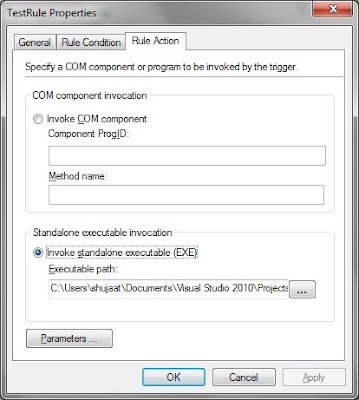 It seems any executable with Message loop is forbidden. This is true even when services are marked as Interactive Services. This is to avoid Shatter Attack. 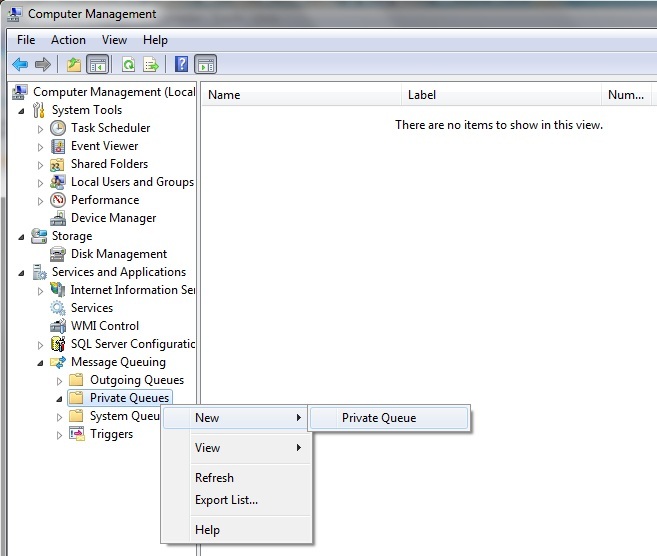 This is just a forbidden tree to even mention about User interaction in Windows Vista and up. 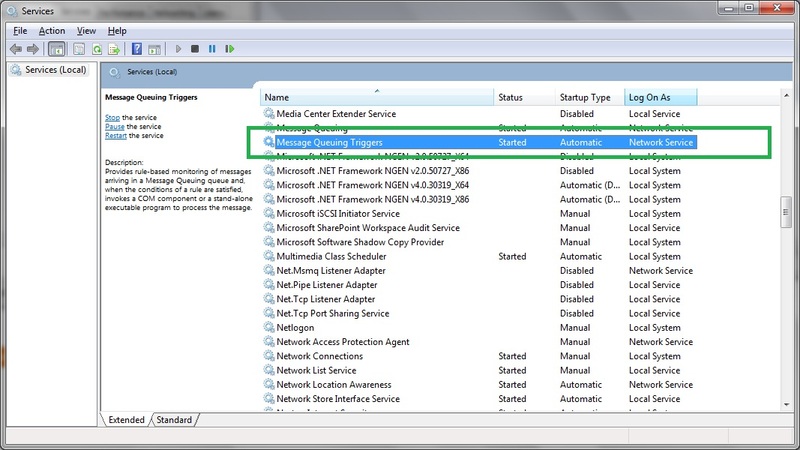 In Interactive Services MSDN mentions: Services cannot directly interact with a user as of Windows Vista. In Windows XP, it loads the application process but it doesn't bring the UI up (still shows splash screen when application is being loaded). 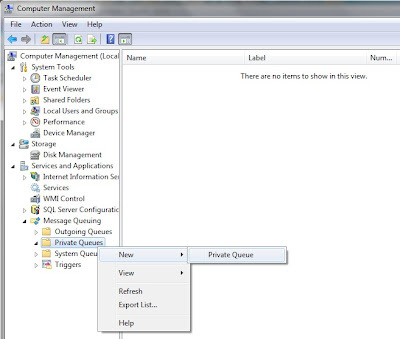 You can verify that the application is loaded using Task Manager. 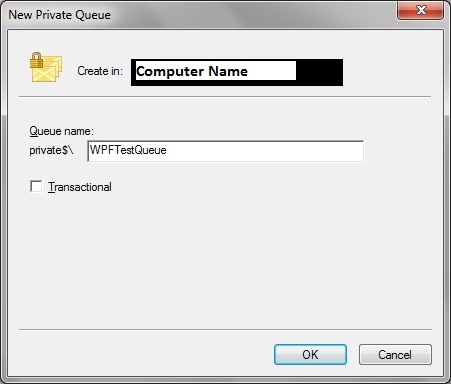 Public queues are used in a domain environment. Your Article Really helped me a lot. but when i tried Asynchronous Receive I'm not able to Use Dispatcher Class. 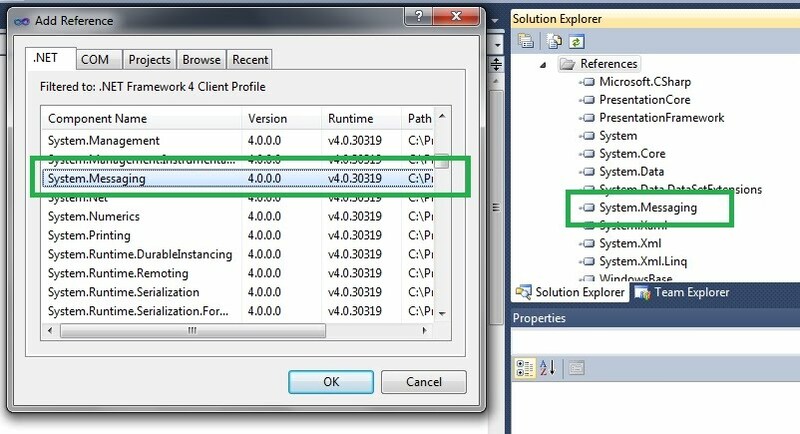 Wont this Class work in .Net Framework 4.0?? ?.Plz clarify my doubt and do the needful.. Thanks Sivan! Can you check if the current thread in the callback has the same dispatcher?